Moist olive oil cake is an easy, one-bowl cake that’s a great alternative to pound cake. 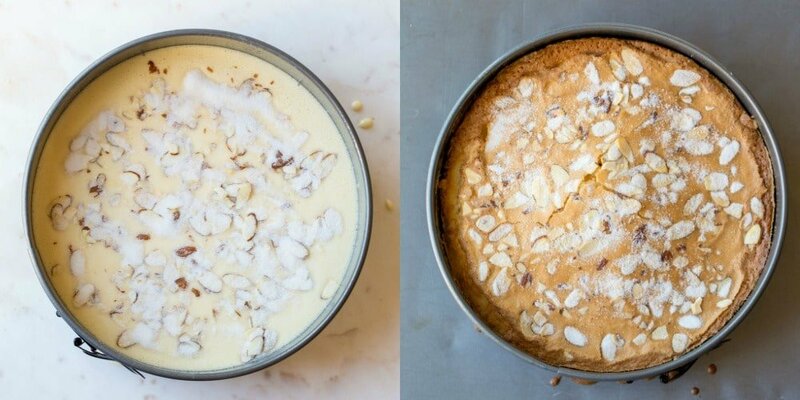 This simple cake recipe is made with pantry staples and takes almost no prep work to make. I love simple, homey cakes that I can whip up in no time and serve with in-season fruit. 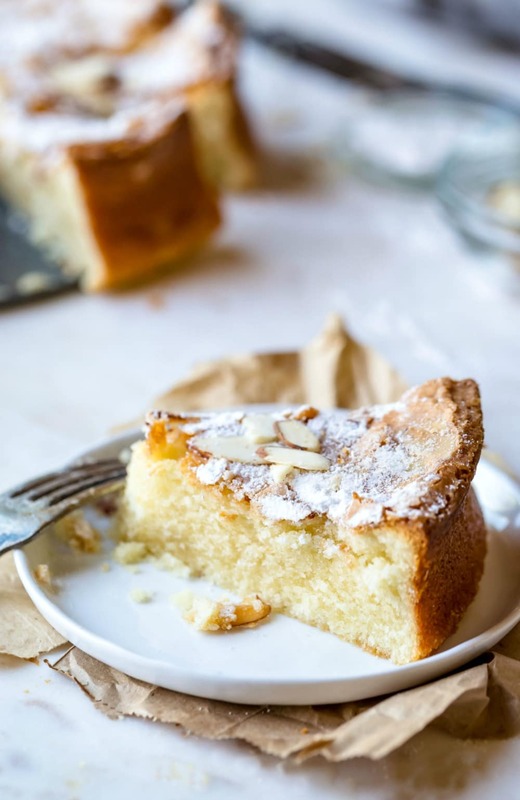 This olive oil cake doesn’t disappoint! It’s incredibly easy to make, made with pantry staples, and tastes great on its own or with fresh fruit like peaches or strawberries. What is olive oil cake? 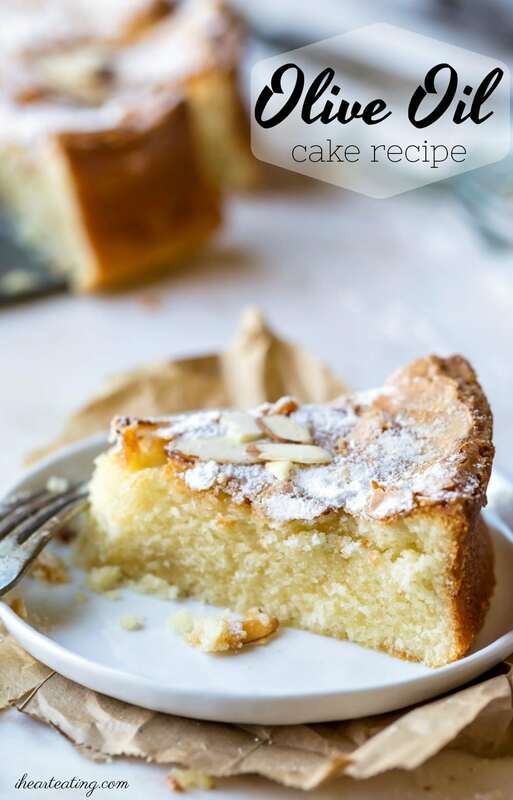 Olive oil cake is a simple moist cake that uses olive oil as the main fat. What does olive oil cake taste like? Not like olive oil! Before I tried it, I imagined that this cake would taste like sweet olive oil, which wasn’t very appetizing. Thankfully, this isn’t the case. Olive oil cakes are usually flavored with citrus, chocolate, or almond. Lemon is the most common flavoring, but the cake is neutral and lends itself to any number of flavors. So, the cake tastes like whatever flavoring is used. One of the great things about this cake is that it doesn’t take much prep or planning. 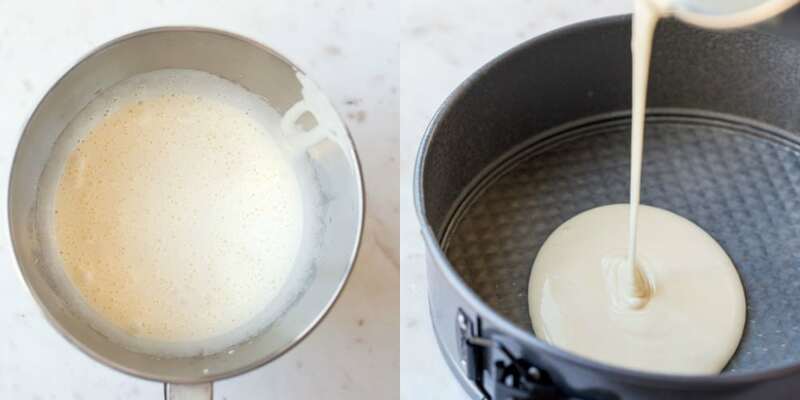 There’s no need to soften butter or let eggs come to room temperature before starting. I use extra-virgin olive oil, and there’s no olive oil taste to the cake. If you’re concerned about the taste, look for a light-tasting olive oil to use in this cake. 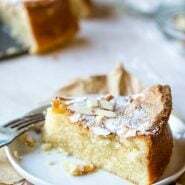 If you’ve tried this olive oil cake recipe, don’t forget to rate the recipe and leave me a comment below. I love to hear from people who’ve made my recipes! You can SUBSCRIBE to receive my latest recipe newsletters or FOLLOW ME on FACEBOOK, INSTAGRAM and PINTEREST for even more delicious food. Whisk flour, baking powder, and salt together in bowl. Set aside. Using a mixer fitted with the whisk attachment, beat eggs on medium speed until foamy, about 1 minute. Add 1 1/3 cups sugar and almond extract. Beat on high until mixture has thickened and is and pale yellow, about 3 minutes. Reduce speed to medium and, with mixer running, slowly stream in oil. Mix until oil is fully incorporated, about 1 minute. Add half of flour mixture, and mix on low speed until incorporated, about 1 minute, scraping down bowl as needed. Add milk and mix until combined, about 30 seconds. Add remaining flour mixture, and mix until just incorporated, about 1 minute, scraping down bowl as needed. Sprinkle almonds over the batter. Sprinkle remaining sugar (a generous 2 tablespoons) over almonds and batter. Bake about 40-45 minutes, or until cake is deep golden brown and toothpick inserted in center comes out with few crumbs attached. Transfer pan to wire rack and let cool for 15 minutes. Remove side of pan and let cake cool completely, about 1 1/2 hours. *If you are worried that your springform pan may leak, place it on a baking sheet to catch any drips. This recipe was delicious. Instead of almonds, I went with orange zest. Tasted delicious, perfect texture. Thank you so much! That sounds like a delicious twist on the cake. =) Thanks for taking the time to comment! Does it matter what kind milk you use? Does it have to be full milk? No, anything from skim to whole milk will work. You’ll end up with a little richer cake with whole milk, but I usually use 1% or 2% because that’s what we have on-hand. Hope that helps! can you substitute Splenda for the sugar? Hi! I haven’t tried using Splenda in this recipe, so I can’t say for certain. I actually scaled this up by 1/4 and it worked well. Takes an hour instead of 45 min to bake if you do it. Excellent recipe, will certainly make again! Good! I’m glad it worked out and that you liked the cake. =) Thank you for commenting! I made it for the first time today using fat free milk and it was awesome. I will be making this again. I was pleasantly surprised at just how good this cake was! Thank you for the wonderful recipe.